I first crossed paths with the original Toki way back in the days when every mall had at least one arcade, and skipping school to spend a pocketful of quarters was a common event. 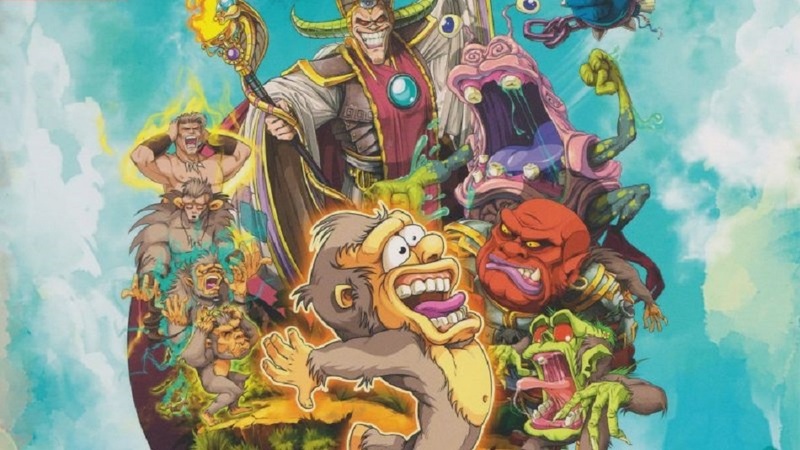 This 2D platformer stood out in my mind even after all these years because it was so odd – the sprites were notably large and well-animated compared to many of its contemporaries, and playing as an ape-man spitting energy balls was unusual fare, even then. I must have gone through the first two or three levels dozens of times, but I never had enough cash to roll credits. So, when I saw some PR about a redone version coming to the Switch, it seemed like a chance to catch one that got away. Now that I’ve spent some time with this updated version of Toki, my nostalgia has been thoroughly burned off and all I’m left with is a good dose of confusion. There’s not much to say about the story except that it’s standard, boilerplate stuff all too common in videogames – an evil wizard steals human Toki’s buxom, blonde girlfriend and devolves him into a vaguely apelike creature. Our now-furry hero then proceeds to go after her because she’s just an object to move the game forward, etc. etc. The less said about this part, the better. Mechanically, Toki can jump on the heads of things and bonk them, Mario-style. He can also spit energy balls and pick up a few short-lived power-ups for his strange oral ability – the flamethrower was always my favorite, and it still is. He can also equip a football helmet as armor, although in a bizarrely realistic twist, it only protects his head. Get hit anywhere besides the head, and he dies. There’s not much else to this formula besides jumping around and generally moving from left to right while dodging or killing various enemies and hitting a boss now and again. Cutting right to the heart of the matter here, Toki is straight-up not enjoyable to play. It was fine as something that I spent .50 cents on before moving on to Street Fighter II or Samurai Shodown years ago, but it feels rough, poorly-designed and just annoying today. Rote memorization of patterns and dealing with swarms of enemies is required to get through each stage successfully, and one hit from any creature will take the ape-man out of commission. If there was a mode that granted infinite lives — there’s no quarter slot on a Switch, after all — I would have simply pushed through for the hell of it and called it good, but for some reason the devs decided to limit the lives and continues. On the easiest level I’m sure that the amount of retries available is more than enough for a person to make it through the campaign with some practice, but Toki isn’t compelling enough to warrant putting the time and effort in. Up to this point, this review basically describes an ancient arcade game that’s been ported to the Switch, which isn’t too unusual. What is unusual? Someone went to great lengths to replace all of the spritework with hand-drawn art and animation. It must have been painstaking labor and I guess it looks… fine? But with all the effort poured into how it looks, it’s bizarre that it plays exactly like it did years ago. Why spend so much time on the graphics and not the rest of the experience? Similarly, there’s no effort put into making this an appealing package for collectors or fans of retro reissues. There’s no mode to restore the original pixel-based graphics (which, to be perfectly honest, I prefer) there are no new modes or additional play types, no infinite lives option, and no historical information that might have given some insight on the original arcade game or why the devs decided to resurrect it today. Toki is a bare-bones, zero-frills offering in every aspect except the redrawn visuals. Disclosures: This game is developed and published by Microids. It is currently available on Switch. This copy of the game was obtained via publisher and reviewed on the Switch. Approximately 2 hours of play were devoted to the single-player mode, and the game was not completed. There are no multiplayer modes. Parents: According to the ESRB, this game is rated E10+ and contains Fantasy Violence and Mild Blood. 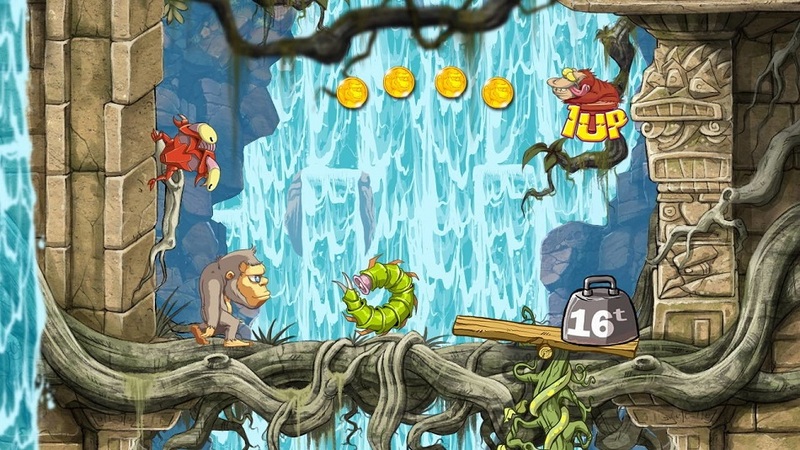 The official ESRB description reads as follows: This is an action platformer in which players help an ape-like creature (Toki) rescue his girlfriend from an evil sorcerer. As players traverse fantasy landscapes, they perform spit and stomp attacks against enemy bosses and creatures (e.g., dragons, ghosts, apes). Enemies cry out in pain and sometimes break apart and/or quickly dissolve when defeated. 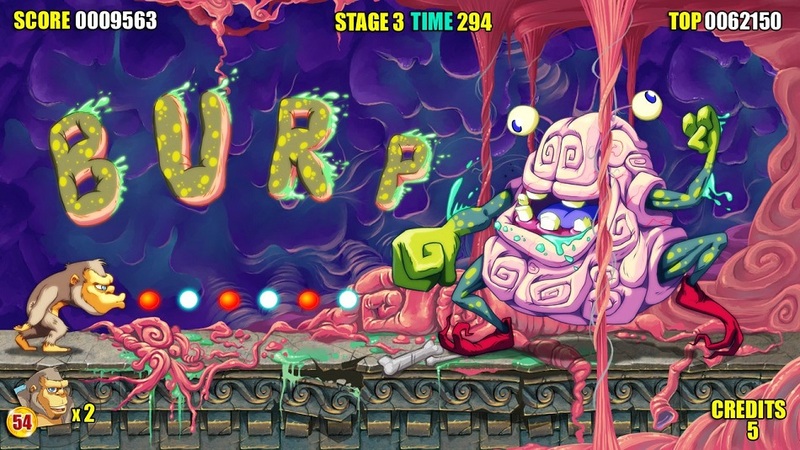 During one boss battle, a cartoony creature is depicted with exposed organs and bones; brief blood-like splashes are seen as players attack the creature’s heart. Deaf & Hard of Hearing Gamers: I played the game entirely muted and had no issues. There’s no text of consequence in the game and there are no audio cues of note. It’s fully accessible. Remappable Controls: No, this game’s controls are not remappable and there is no control diagram. A and Y shoot, B and X shoot, and Toki’s movement is handled by the left analog stick or the left d-pad buttons.